Published by the American Geophysical Union as part of the Geophysical Monograph Series, Volume 187. The focus of Surface Ocean: Lower Atmosphere Processes is biogeochemical interactions between the surface ocean and the lower atmosphere. 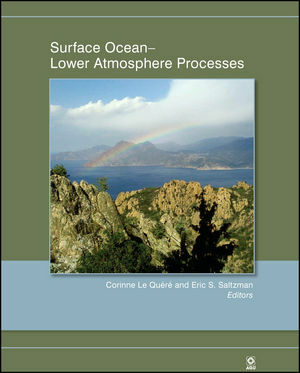 This volume is an outgrowth of the Surface Ocean-Lower Atmosphere Study (SOLAS) Summer School. The volume is designed to provide graduate students, postdoctoral fellows, and researchers from a wide range of academic backgrounds with a basis for understanding the nature of ocean-atmosphere interactions and the current research issues in this area. A framework of underlying physical/chemical/biological principles, as well as perspectives on current research issues in the field. The readership for this book will include graduate students and/or advanced undergraduate students, postdoctoral researchers, and researchers in the fields of oceanography and atmospheric science. It will also be useful for experienced researchers in specific other disciplines who wish to broaden their perspectives on the complex biogeochemical coupling between ocean and atmosphere and the importance of this coupling to understanding global change. Corinne Le Quéré FRS is a Franco-Canadian scientist. She is Professor of Climate Change Science and Policy at the University of East Anglia and Director of Tyndall Centre for Climate Change Research. Eric S. Saltzman is the editor of Surface Ocean: Lower Atmosphere Processes, published by Wiley.